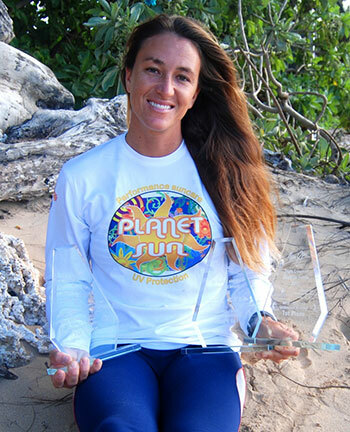 This weekend, Planet Sun Paddler Andrea Moller attempts to become the first woman ever to claim three back-to-back victories at the Molokai to Oahu Channel Race. Ms. Moller won the event last year on stand up paddleboard, setting a women’s course record with an incredible 5 hours, 26 minutes, 51 seconds finish time. The “Molokai- 2- Oahu Race”, heralded as the World Championships of Paddleboard Racing, pits competitors against a most formidable challenge. Covering 32 miles of open-ocean, over 300 competitors will cross the Ka’iwi Channel (also known as the Molokai Channel) from the North Shore of Molokai to the South Shore of Oahu on prone paddleboards or stand-up paddleboards (SUP). The fastest athletes typically complete the crossing in just under five hours, facing treacherous currents, open-ocean swells of up to 30 feet and depths up to 2,300 feet. This year’s race, set for 29 July, boasts the largest women’s field ever. Andrea Moller knows the Ka’iwi (kah-EE-vee) Channel very well. She has crossed the channel 14 times, earning 10 championship titles, and has the course record on stand up paddleboard. Andrea is also the only woman to win the event on both stand up paddleboard and Ocean Canoe (OC-1 relay and OC-6). One of the most respected waterwomen in the world, she has amassed an impressive collection of ocean sport titles and is known for her exploits in surfing “Jaws” on Maui. Andrea also recently won the Triple Crown of Stand Up Paddling, taking all three races in the series, with the longest leg at 27 miles . Previous articleWould You Stand Up Paddling With a Great White?